El Santo and Blue Demon were Mexico's two most popular Lucha Libres. Hated rivals in the ring, they formed an inseperable pair onscreen, akin to a Spanish Dynamic Duo. Of the two, Santo was always the unquestioned leader as he was the older and more popular (he more than almost anything else in Mexican pop culture has become a living legend). This annoyed Blue Demon to no end as by this point in their careers, he was basically mopping the floor with his hated rival in match after match. But since he never quite achieved the same level of recognition, he had to settle for being second banana whenever forced to team with the Man in the Silver Mask on the silver screen. This is one of their later pairings and one of their better ones. In this adventure, Santo is called into action by his girlfriend, Lina after her uncle, a noted Professor disappears. We learn that he has been kidnapped by a hunchback who uses the professors blood to revive his master, Dracula. The legendary vampire was slayed by the professor's ancesstor many moons ago and Drac has placed on a curse on the family name, meaning the professor's niece is in danger as well. Reviving his old partner in crime, Rufus Rex (!) alias The Wolfman, the pair set out to put the bite on the population; turning them into a small army of vampires and werewolves. Meanwhile, Santo elists the aid of his tag team partner Blue Demon in order to release Santo's squeeze of the family curse and put an end to our evil bloodsuckers' reign of terror. 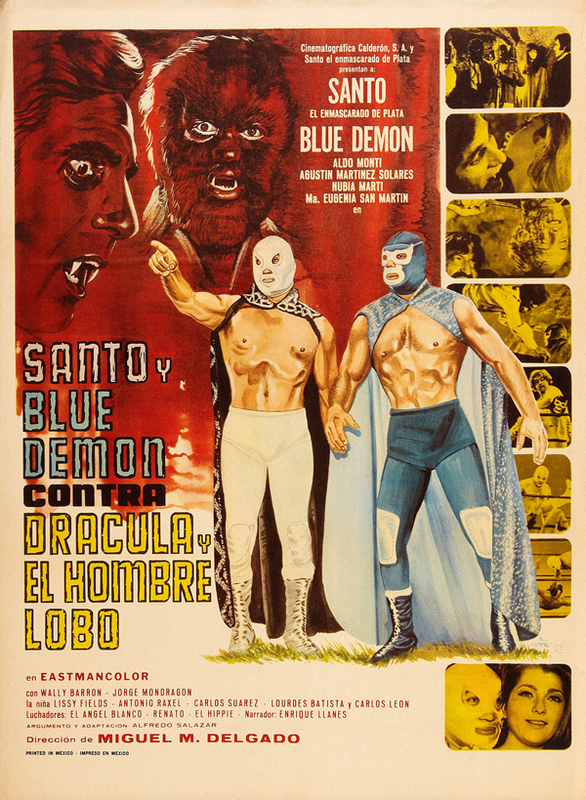 An entertaining mix of Universal and Hammer horror sensibilities, 'Santo and Blue Demon vs Dracula and the Wolfman' manages to offer straight faced fright entertainment despite the typically bizarre nature of seeing two masked superheroes as the protaganists. As is typical of the series, our heroes NEVER take their masks off, not ever. They literally ARE their ring personas. Watching our two legendary Luchadores in action onscreen, you would never have an inkling of the bitterness that existed off of it. They were a natural, charasmatic pair whether either of them liked it or not. As is typical of these films, there are several lengthy ring bouts to pad the running length. This is especially dire in the later films where the matches are too obviously filmed in an empty, dressed up soundstage (where are those audience cheers coming from?). The matches themselves are just O.K. but it's tough to dislike them when one of the opponents goes under the name, 'Renato, the Hippie'! The horror scenes are handled quite well here with Aldo Monti making for a dapper, yet threatening Drac (he had previously played the role in 'Santo and the Treasure of Dracula' and Agustín Martínez Solares does a decent job as a decidedly Paul Naschy-like Lycanthrope. The finale where Santo must rescue a kidnapped Blue (oh, the indignity!) from becomming wrestler lunchmeat in an underground cavern that features a spike laden pit is one of the best and most energetic in the entire Lucha genre. Santo and Blue battle (typically with punches, slaps and the occasional wrestling hold) a legion of transformed werewolves before settling the deal with the main gruesome twosome. Mucho fun! But despite the exciting climax, the most memorable moment comes midway through the film. While watching over Santo's woman, he and Blue pass the time by playing chess. There's just something so profoundly odd, yet totally right about watching two masked Mexican wrestlers playing chess together... in costume.